It all started with the idea to give aspiring models a ‘virtual toolbox’ to hone their skill on their way to a professional career. In our initial research phase we asked several photographers how we could help young models as well as their photographers. The one thing all photographers criticized was a lack of posing skills. Interviews with agents and other professionals in the fashion industry revealed that many young models are not familiar with the ‘terminologies of the trade’. Goal: support photographers, agents and of course models by combining vital information and DIY-coaching in one intuitive app. 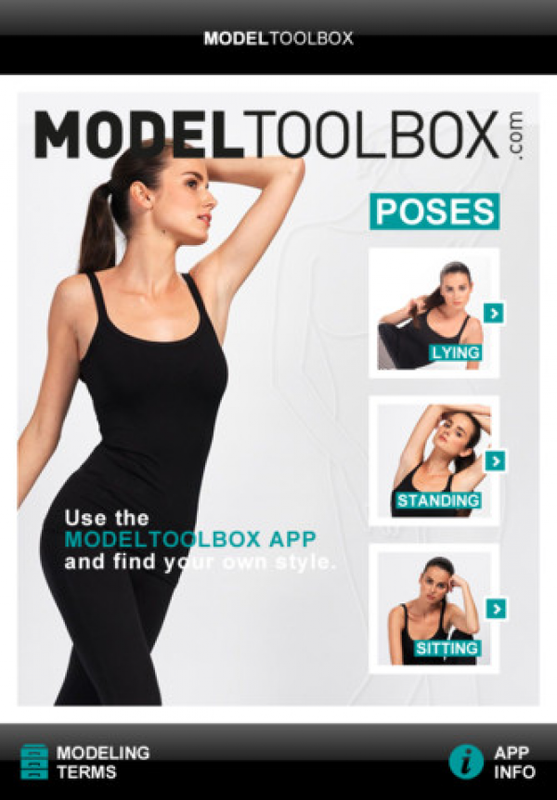 The Model-Toolbox App is a brand new model trainer and model guide designed for professionally models who want to work on their posing skills and develop their own unique style. 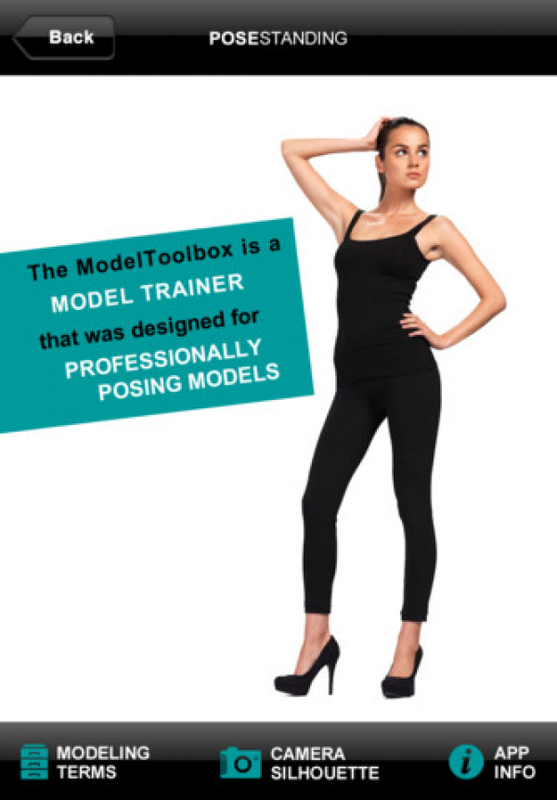 Model-Toolbox is also a valuable tool for photographers to direct inexperienced models and show them alternative poses. The app is available for iOS and Android. We deliberately chose a broad range of fresh and practicable poses for photo shootings and posing tips for this app. Many of these poses can be found in photos of leading international fashion magazines. Basically, the app shows you how to pose for pictures in a professional environment. 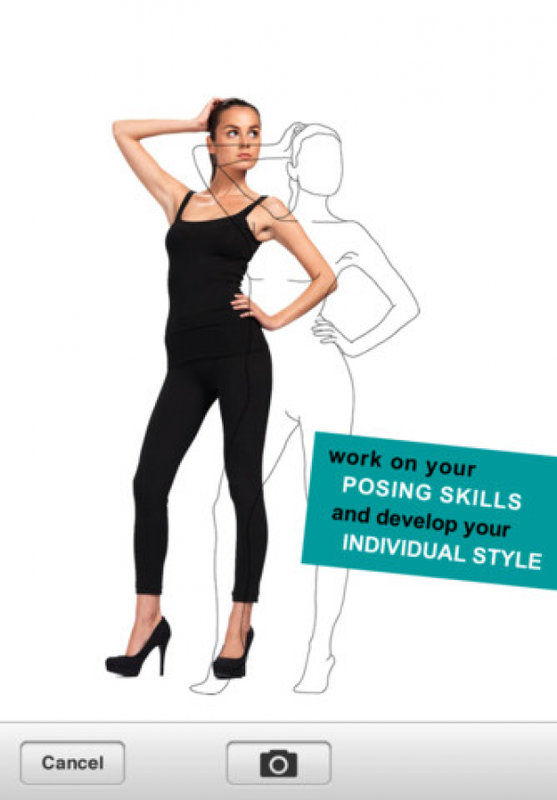 This app shows models how to pose correctly and find their own style by learning the basics from professionals. The poses included in the posing section are a best-of summary consistent with standard poses from various fashion magazines. They are divided in three categories: lying, sitting and standing poses. The poses of each category come with silhouettes, which clearly outline final positions for the respective poses. The actual image with the model helps you to get a better feeling for each pose. It is up to you to decide if you want to use these images just for inspiration or as guidelines for your friends to direct you to the right position. As soon as you are in the position you want to try out, your friend takes a picture of you via the Model Toolbox app. You always have the option to see the picture with or without the silhouette. Another essential part of this app provides basic information about industry-specific terminology. 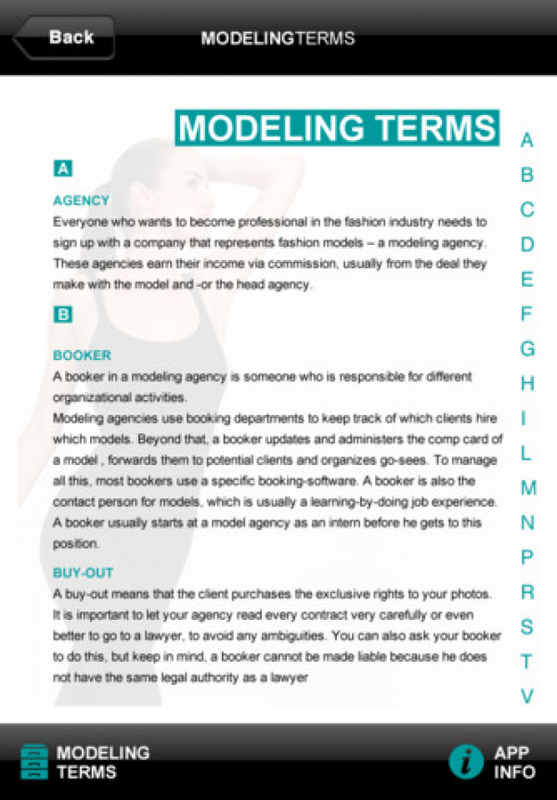 This dictionary includes the most frequently used terms from the world of modeling you need to know. This basic course includes vital trainings and information every model needs to know. The appealing visual design provides an intuitive, fun and user friendly interface that users find comfortable, easy and entertaining. Our marketing efforts mainly concentrate on the social networks and traditional online marketing - including Facebook as well as Google ad-words. It was also promoted via an international press release to the major companies, which focus on photography, modeling and fashion. The general marketing tools such as below-the-line campaigns with flyers as well as a website www.model-toolbox.com with additional in-depth information and a making of video from the photo shooting for this app are currently in their final stages of development and will be launched shortly.